Remodeling Your Home in Carmel? If you’re here, chances are you’re a Carmel resident looking for remodeling design ideas, a contractor, or both. But no matter where you call home, whether your design taste is traditional or modern, you’ll find the resources here to make your remodeling project something very special. Carmel is a warm slice of Americana with a heaping dollop of arts and entertainment, helping make life extra sweet for more than 70,000 residents. Also known for its family-friendly neighborhoods and exceptional schools, the city was chosen by Forbes magazine as the number one place to raise a family. There’s a lot to soak in and enjoy in this very special place to live, especially for those who love art and design. 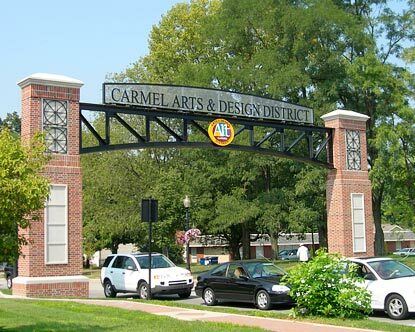 Carmel’s Arts & Design District along the Monon Trail is an appealing collection of shops, boutiques, and artisan restaurants—including the new Indiana Design Center. If you haven’t been in, drop by and discover the IDC’s showrooms, design professionals, artists and endless resources for residential and commercial interiors. The first floor is open to the public, with to-the-trade resources on the second floor accessible through a design professional. With more than 120 distinctive neighborhoods, Carmel’s homeowners take great pride in their abodes, from modern spacious homes to small arts and crafts bungalows. Carmel’s buildings and dwellings form an eclectic blend of innovation, style and history, and WrightWorks masterfully completes every Carmel kitchen remodel, bath remodel, basement finish, whole house renovation or home addition with these things in mind. Updating and Renovating Your Home in Carmel – What Really Matters? If you’re looking to enjoy living spaces that seamlessly blend form and function, WrightWorks’ showcase remodeling services are a perfect fit. We feel that a well designed kitchen, bath, or whole house renovation should be about much more than raw square footage or dollars spent; and that delivering a comfortable, safe experience during your project is just as important as the end result. When homeowners walk through our completed projects they most often comment about how everything just “fits”—with every detail well thought out and in its place. The custom millwork, artisan tile, cabinetry, and fine finishes all blend together to form a whole that is much more than the sum of its parts. Beautiful and functional. But we’re proud of more than just the quality of our craftsmanship. Ask our past clients what they enjoyed most during their project and they’ll tell you how comfortable they were with our craftsmen working in their homes. When you place your trust in us to work on your most personal spaces, we take that responsibility very seriously. We can transform your home into an amazing, beautiful place to live–built with skill, precision, and an experience that’s comfortable and safe. If you’re ready to start planning your renovation, take the first step and give us a call or fill out our contact form. Just click on the link below and we’ll take it from there. We look forward to serving you and your Carmel home!